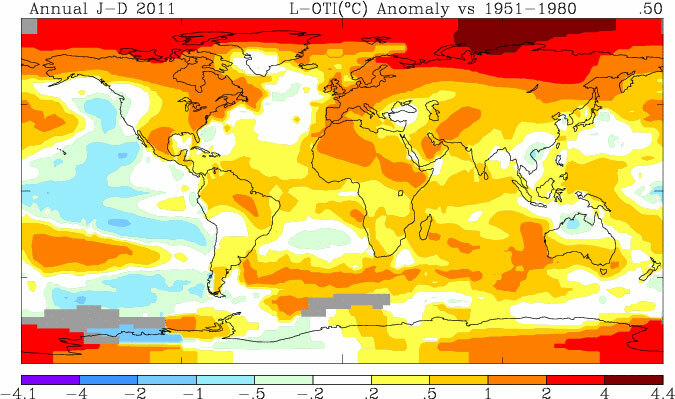 According to Nasa scientists the global average surface temperature in 2011 was the ninth warmest since 1880. The finding continues a trend in which nine of the 10 warmest years in the modern meteorological record have occurred since the year 2000. NASA’s Goddard Institute for Space Studies (GISS) in New York, which monitors global surface temperatures on an ongoing basis, released an updated analysis that shows temperatures around the globe in 2011 compared to the average global temperature from the mid-20th century. The comparison shows how Earth continues to experience warmer temperatures than several decades ago. The average temperature around the globe in 2011 was 0.92 degrees F (0.51 C) warmer than the mid-20th century baseline. The difference between 2011 and the warmest year in the GISS record (2010) is 0.22 degrees F (0.12 C). This underscores the emphasis scientists put on the long-term trend of global temperature rise. Because of the large natural variability of climate, scientists do not expect temperatures to rise consistently year after year. However, they do expect a continuing temperature rise over decades.